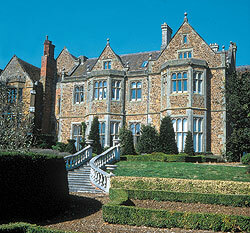 Fawsley Hall stands in 2000 acres of quiet parkland beside a 14th century ironstone church. All the bedrooms including three suites and six four-posters have dataports and digital television, power showers and telephone extensions in the bathroom. The restaurant (originally an Elizabethan kitchen), serves international cuisine with the emphasis on fresh game and fish. What a perfect place to be pampered for that promised midweek, weekend or short break!